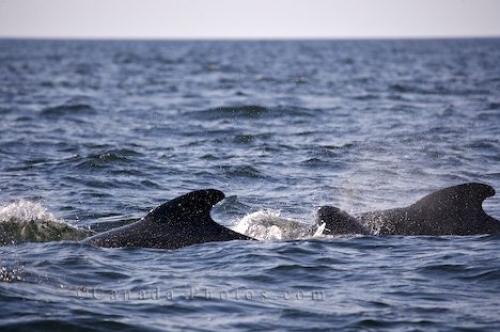 Between the waves of the Gulf of St Lawrence in Cape Breton, Nova Scotia, black dorsal fins are spotted by passengers aboard a whale watching tour. Each picture that is taken is confirmation that this tour boat has come across a pod of Long Finned Pilot Whales playing in the area. Picture of a small group of Long Finned Pilot Whales surfacing in the Gulf of St Lawrence in Nova Scotia, Canada.